Azman Mokhtar's Khazanah Nasional has brought into Malaysia Airports a couple of new directors, fuelling suspicion of yet another attempt to push out president and group CEO Tan Sri Bashir Ahmad. If there's really, absolutely nobody from Malaysia Airports who is good enough to lead Malaysia Airports, surely we must consider Khazanah's longstanding dream of bringing in an outsider to helm the GLC. But, please lah, the candidate must have a good track record. Plus, I am sure Bashir has a succession plan. If he doesn't have one by now, damn! running dog, whats next from you? wanna more whisky in exchange for your soul, dog? Will that put the kibosh on MAHB's reported plan to join a consortium that would be bidding to acquire Stanstead Airport in the UK? Perhaps there is a feeling among the powers that be that MAHB's flagship KLIA is losing it's shine against competition from the likes of Seoul Incheon, Hong Kong International and Changi Airports in the region. Could the next step be to privatise MAHB or will Khazanah sell a significant stake to a third party airport operator, with management control? With the Asean open skies agreement kicking in by 2015, and facing ever-increasing competition from mega airports in the Gulf region, the government cannot afford to let KLIA's position in the regional pecking order fall any further. That would necessitate fresh thinking and management. Do you know that Maybank decide not to renew its 6 month loan to FELDA IPO's shareholders? The loan will expire this coming 11th Dec.
Today, FGV price is only at 4.61 compared to purchase price of 4.65. Investor sudah loss 0.04 sen. Add interest on 6 months loan to Maybank ... tambah lagi losses. Whatever it is ... many people sudah manyak marah ooo.. sebab sudah rugi beli ini FELDA punya share. Bashir Ahmad is a crooks..period. Woi Rocky, why you always promote and defend crooks...crooks like Madey, Najib, Rosmah, Muyhddin and now this Bashir chap !! Nobody seems to have a plan for anything in Malaysia. The country is being run like a rudderless ship or a ship with no captain. Suruh diorang attend dulu KURSUS Gani Petail dan MACC untuk halalkan RASUAH! Geng-geng Khazanah ni asyik dok rotate muka-muka yang sama. Dari GLC tu pergi GLC ni. Gaji mengalahkan Yang Dipertuan Agong. PM pulak pejam mata. Bila lagi laa nak ambik tindakan? Rocky,as usual Umno cronies power play at work.I am sure you know what I am talking about.Rout them out,will ya? Once a crook always a crook.Once a crony alway a crony.No matter good or bad,Khazanah will be seen as a useless GLC out to fulfill their managers personal piggybanks. It is Umno cronies mentality at work.Always the factions among the cronies in coporate power plays.Look what is happening in your MM,NST and the rest of the Umno stable.Open your eyes,ears and mouths if you guys are not blind,deaf and dumb. Heads are being moved in time before the next GE13. Whats your take on Zaki Zahid moving into KFC-QSR? AMOKs contract as MD will end March next year,maybe there is a hidden agenda behind this exercise.We just wait and see. AMOKH is doing a good job otherwise the wise Najib will not retained him. It's a simple logic. Kalu Syed Hamid boleh lepaskan PULAU BATU PUTIH,,,Silap-silap MAHB gadai juga kalu bagi pada Syed Feisal,,,Abang Adek Ma,,!!! Is it for Bashir to have a successheion plan? Unless of course he is the controlling shareholder. Otherwise it should be the boards or whoever the controlling shareholders are. I am not suggesting that I approve of what Khazanah might be up to, or if this is a case of cronyism. 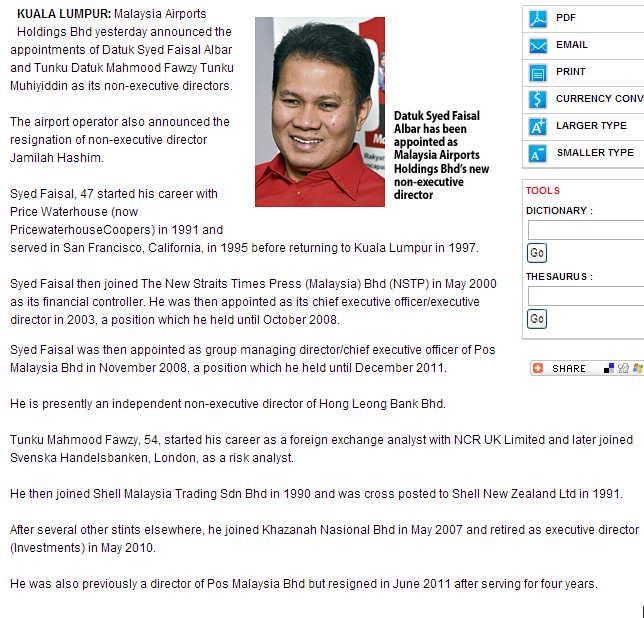 But if Khazanah are the majority shareholders, then it is for them to put in donkeys as directors. Really! One of Najib's key task towards the success of the ETP is getting the right corporate leaders to helm our GLCs. And the yardstick should be plain and simple; if you are incapable of manning a company with ready government contracts, special licences and God knows what business previllages, then out you go! Sadly this is not happening more often than not. Its acutely similar with our political scene where GOOD FOR NOTHING EXPIRED POLITICIONS always got their way by blackmailing BN when in the real actual commonsense world, these so called warlords is worth nothing. In fact we keep asking ourselves, is the Top Leadership stupid for keeping them? NAJIB SHOULD REMEMBER THIS, AND THIS ONLY. We the Rakyat is not stupid to vote the opposition just because an expired person like Lajim Ukim said he controlled the votes in his constituency thus pick him or face death. REMEMBER, ITS OUR VOTES THAT UNSEATED PAK LAH. If we can do that to the PM, then who are these jokers? So Najib better start doing MANY EASY DECISIONS (what so hard about it anyway?). The same goes to the so called corporate, and agency leaders. We the Rakyat have been a loyal obidient supporter for far too long. And they are abundance up there. Why should Najib risk his power over these people? Are these people more important than The Rakyat and The Country? BN and Najib should take this grand opportunity as, lets be honest, you are facing a super incapable and untrustworthy group as your opponents in the next GE. Should your opponents are a group of highly capable group of people with clear vision in leading this country, then BN can kiss GE13 goodbye. Do all the needed changes immediately, and we the Rakyat will be behind you. Rocky,what is the difference between Bigdog,Deepak and Musa Hassan.They were cronies and stooges of Umnoputras. Why stealthily?Because Rocky's buddies are getting the boot.Hehehe.Or else he will be as quiet as a tikus. the arab spring will soon be here.where will bigdoggy and you be hiding,rocky. Surely PMO has authority over Kahazanah as they are using taxpayers funds? If Najib can't deal with this issue of AMOKH when you can see it - why doesn't he do so? Does it mean he has no cojones? KUALA LUMPUR: Khazanah Nasional Bhd's board of directors has renewed managing director Tan Sri Azman Mokhtar's contract for another three years. The government's strategic investment fund said on Friday the new three-year term would be from June 1, 2013 to May 31, 2016. Azman, 51, assumed his current position on June 1, 2004. It will be interesting to see how MAHB will explain how the consortium they are a member of was kicked out of the Male airport project in the Maldives. Apparently, the consortium backed the "wrong horse". And when a change of administration took place in the Maldives, it was kaboom for the consortium. Let's see how much they get in compensation from the Maldives government and how much they will have to "write off" in terms of monies already spent.